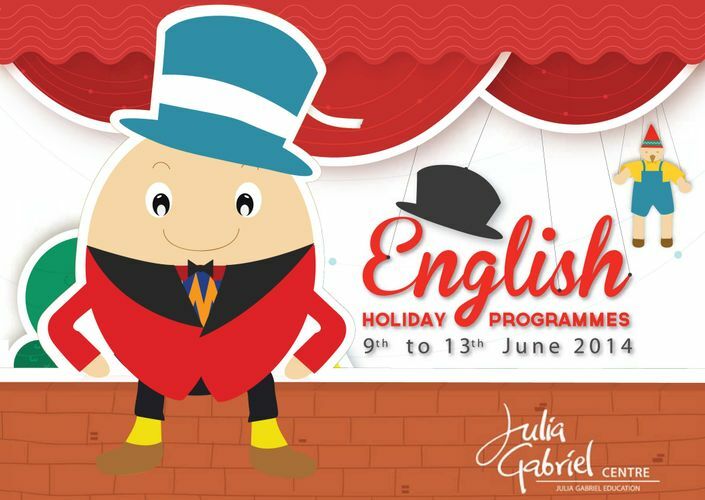 Make the most of your child’s school holidays with a fun-filled week at Julia Gabriel Centre’s English holiday programmes from 9th to 13th June 2014. Tailored for children aged 6 months to 11 years, these programmes have been designed to instil a joy for learning, inspire creativity and enhance their reading, writing, speech and drama skills through the imaginative world of toys, puppetry and nursery rhymes. Join us for a magical exploration of words, sounds and characters as nursery rhymes come alive during this fun-filled week. Aimed at laying a firm foundation for enjoyable language learning, this adult-accompanied programme incorporates sensorial activities, songs, stories and interaction with puppets. Designed to inspire curiosity and awareness in each child, the programme concludes with a garden party with Jack, Jill and Humpty Dumpty at the end of the week. Embark on a journey of discovery with the King of Wild Things as he travels to meet creatures from different places within the wild kingdom. Children will have the opportunity to develop listening, reading, writing and speaking skills through phonic and world games, comprehension activities and the creation of a daily adventure journal of the King’s encounters. They will also be guided in making their own puppets and encouraged to stretch their imaginations as they shape the unique characteristics of their own puppet. Explore the secret world of puppets at the Museum of Toys, who come to life every night at the stroke of midnight and uncover what the Master Toymaker has been up to in attempting to create the most unique toy for Mr Claus. Using a wide variety of poems, prose and speech exercises, children will learn to appreciate literature and stimulate their imagination through drama. The famous puppeteer Saito San has mysteriously disappeared from his studio while working on a secret collection of puppets. A ransom was found in the newspaper claiming that he will only be released once his creations, which were left unfinished, come to life. Join the Mouthpiece Mechanics for a thrilling week as they attempt to save Saito San by completing what he left behind. Learn the mechanics of character building, story crafting, expressive voice and story delivery. These English school holiday programmes will be held at Julia Gabriel Centre, #04-00 Forum The Shopping Mall, 583 Orchard Road, Singapore 238884. A special 15 per cent group discount is available for registrations of four or more children and a 10 per cent discount will be offered to DBS/ POSB credit cardholders. Only one discount package is applicable per student. For more information on the full range of English holiday programmes, registration and discounts, call 6733 4322, email enquiries@juliagabriel.com or visit www.juliagabriel.com.